This topic contains 0 replies, has 1 voice, and was last updated by n0xew 1 year, 1 month ago. Today I’m a writing a very specific tutorial that may be used to fix the same issue on other games. 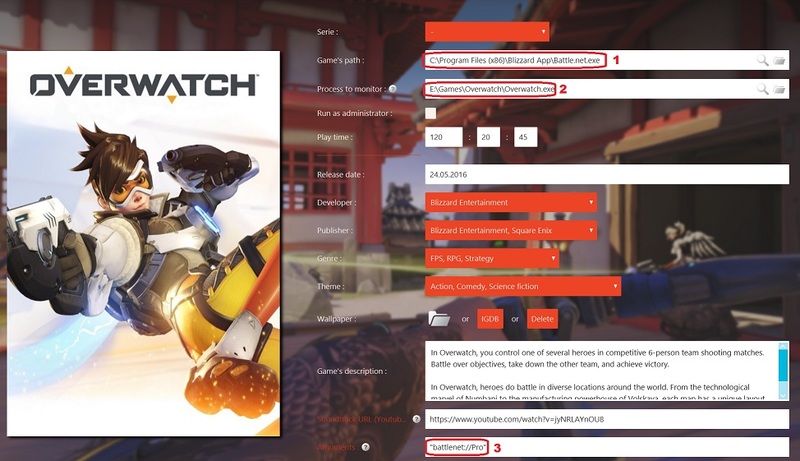 I really like Overwatch but one of the things that really irritates me is that when starting the Overwatch.exe application directly, it requires you to input your credentials. Having a 16 digits long randomly generated password, I have done that once and abandonned the idea of doing it again. Well, after some researchs and with the “Monitor to process” option added with update 1.1.2.0, I can finally start Overwatch via GameRoom without having to type my credentials and with playtime being properly recorded! Here is how to do it. Game’s Path: Set here the Battle.net client executable file, e.g. C:\Program Files (x86)\Blizzard App\Battle.net.exe. Process to monitor: Set here Overwatch’s executable file’s path, e.g. E:\Games\Overwatch\Overwatch.exe. This means that GameRoom will monitor this executable file in order to compute your playtime. Arguments: Set here --exec="launch Pro", with the quotes! This will make Battle.net launch Overwatch without asking you to login. Now save your settings. Et voilà, you can enjoy starting Overwatch via GameRoom, with your playtime being recorded as usual! This topic was modified 6 months, 3 weeks ago by n0xew. Reason: New CLI args, replaced "battlenet://Pro" with "--exec="launch Pro""